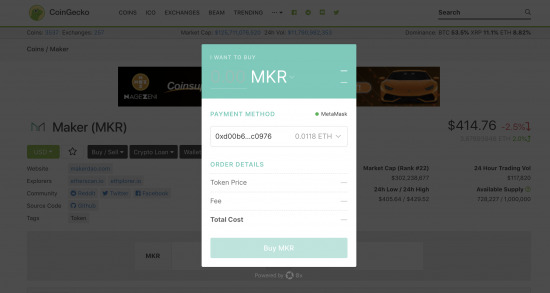 An open protocol for decentralized peer-to-peer (P2P) exchange of Ethereum tokens today launched Instant, delivering an easy way to purchase tokens, opening up a new global financial system. 0x, founded in 2017 by Will Warren and Amir Bandeali, is aiming to create a platform where all assets can be tokenized and freely exchanged. This includes fiat currencies, stocks, bonds, commodities, debt instruments, real estate, video game items, digital collectibles and software licences, to name a few. Businesses and projects, known as relayers, build on top of 0x to service a wide range of markets, from in-game items to traditional financial assets. It is these relayers that create products, which plug into 0x's public infrastructure, allowing users to exchange any crypto token created using Ethereum standards, such as ERC-20 and ERC-721 (non-fungible token) assets. Following the second version of the 0x Protocol earlier this year, and in its continued quest to leave the geographic lottery behind by establishing an open and globally accessible financial system that acts as an equalizing force for the world, 0x has created Instant, delivering a secure and seamless interface. Explaining how it works, Warren, who is also the CEO of 0x, said that it's a "one-click buying interface built on top of 0x that gives developers and businesses a flexible, yet simple way to integrate token purchasing into any app or website." Anyone in the world can host an implementation of Instant by embedding it in any product experience, he continued. Instant aggregates liquidity from 0x relayers for any ERC-20 or ERC-721 asset, calculates the best orders to fill and lets users pay for these assets with ETH. For instance, in order to take part in Augur prediction markets, users need to purchase REP, the native Augur token, said Warren. 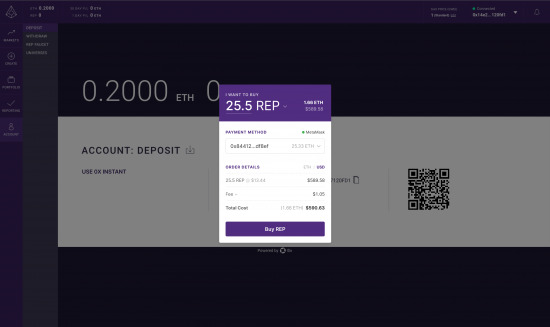 So the Augur team have implemented Instant to create a seamless onboarding experience for users to buy REP with their ETH. Others that are using 0x Instant include Coinbase Wallet and CoinGecko. 0x Instant is aiming to aid businesses and developers such as news sites, crypto wallets, dApps or price trackers to monetize or add a new revenue stream to their existing pipeline. According to the platform, hosts can earn up to 5% in affiliate fees on every transaction. On top of that is the fact that 0x are delivering an easy and flexible integration of Instant. If developers are after simple token purchasing functionality embedded in an application, they can copy a few lines of code after they choose 0x's off-the-shelf UI design, and use the Instant Configurator to select the tokens they want to offer to their users and the affiliate fee percentage, if any, Warren said. "If a business wants a more custom solution and have full control over how the UI is designed, they can integrate the AssetBuyer engine," he added. "AssetBuyer abstracts out many of the complexities of sourcing orders and performing market buys in the 0x network." All of which will have the added benefit of bringing new users to the 0x platform, deepening overall ecosystem liquidity by creating more transactions on the network and promoting the retention and use of tokens, the platform noted. With the tokenization of assets continuing to gain pace, 0x is providing a platform where real estate brokers, digital artists and game developers can sell or exchange their crypto tokens. For instance, last month, in the first offering of its kind, it was reported that U.S. investors are able to purchase a piece of real estate in South Carolina in the form of tokens, in a $20 million sale. According to Warren, this is significant because it amounts to the first tokenized real estate investment trust (REIT) in the U.S. He added that the real estate tokens will be available for exchange on an 0x relayer called The Ocean. They have integrated 0x into both the in-game experience to enable purchasing of NFT cards and a marketplace called Apollo for digital in-game items. We see a lot of interest from indie game developers and digital artists that want to use Instant to offer their NFTs to the market." Additionally, projects such as dYdX, an ethereum-based derivative token startup, are being traded on 0x relayers like Radar Relay or Veil, an 0x prediction market relayer running on testnet that enables new markets, such as betting on the virality of memes. According to Warren: "0x Instant will further enable these markets to develop as it dramatically lowers the time and effort required to add crypto purchasing to apps and websites." At the moment, when people think about how to purchase crypto, they think of two things: First buying through a custodial service, requiring users to sign up for an account, link personal banking details and then deposit funds. The second is purchasing through an order book exchange with, as Warren says, "a complicated mix of candlesticks and bid-ask spreads." 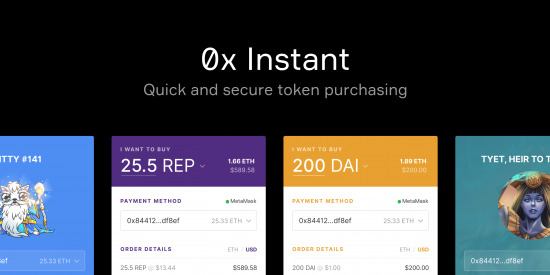 0x Instant, though, is aiming to redefine how people purchase crypto assets. By introducing it to the applications that join the 0x relayer network, users will have the ability to purchase a number of tokens, thereby growing 0x's networked liquidity tool, and, in turn, increasing the number of relayers plugged into the 0x network. Ultimately it's another step towards our mission of allowing all tokenized forms of value to flow freely and removing obstacles for people to access a new global financial system, Warren said.